With the rapid growth of the Internet, banks have changed the way financial services are being designed and delivered. Internet banking has gradually replaced the traditional based counter-form of banking because it offers many advantages amongst which are: improved efficiency of payment and other financial services, decongesting long queues found within the banking halls and on the part of the banks, it gives room for improvement in building a solid bank-customer relationship and allows banks’ expansion without physically establishing new branches . Majority of the banks in Nigeria have introduced internet banking services which include electronic funds transfer, account balance enquiry and statement, automatic payroll deposits, bill payments, airtime purchases, cheque confirmation, salary advance request, investment and loans, standing order, foreign exchange transactions and feedback to customers. This provision has led to stiff competition amongst the banks. Despite the availability and benefits of the internet banking services, there are many challenges that face the adoption of these services such as perceived risk in terms of cyber fraud and security/privacy risk , as well as high cost of Internet facilities . However, one of the greatest challenges lies in the provision of excellent quality service from the customers’ perspective, as customers have high hopes on the quality of service they are expecting from the banks. According to Al-Hajri , banks must make improvements in the quality of their Internet banking platforms to achieve customer satisfaction; hence, providing ample opportunities to impress customers which in turn encourages them to be loyal to their banks. Oliver  defined satisfaction as pleasurable fulfillment, where the consumer believes that consumption fulfills some need and this fulfillment is pleasurable. Customer loyalty has also been described as a “deeply held commitment to rebuy or repatronize a preferred product/service consistently in the future” . This study adapted the E-SQUAL scale, using the six dimensions of efficiency, availability, fulfillment, privacy, responsiveness and contact to understand undergraduates’ satisfaction and loyalty to banks’ internet banking services . According to Omotayo and Adebayo , young people especially students are more enthusiastic about adopting and using internet technology than old people. Previous studies on customer satisfaction and loyalty to internet banking services among youths have been undertaken mainly in foreign countries with such studies showing that young people have more positive attitude and intentions towards using internet banking . Some others have shown that the dimensions of assurance, empathy and responsiveness have positive impact on customers’ satisfaction and loyalty among undergraduates . A recent study carried out in Nigeria on internet banking amongst university students by Onaolapo and Anene  only evaluated the relationship between bank service quality and adoption of internet banking among selected students of tertiary institutions in Oyo State, Nigeria. The study revealed that the quality of a bank website is a significant attribute for determining customers’ adoption of internet banking services. A major gap in Onaolapo and Anene  study is that it focused on the determinants of adoption of internet banking. Beyond adoption, there is a need to understand factors influencing satisfaction and loyalty among this population of internet banking users. Hence, this study adopted the Parasuraman, et al. E-S-QUAL scale to investigate the factors influencing undergraduate students’ satisfaction and loyalty intentions in the use of internet banking services of Nigerian banks. This study adopted the E-S-QUAL scale developed by Parasuraman, et al. . The multiple-item scale was developed for measuring the service quality delivered by Web sites on which customers shop online. The basic E-S-QUAL scale consisted of four “core” dimensions- efficiency, fulfillment, system availability, privacy. The second scale, E-RecS-QUAL, is salient only to customers who had non-routine encounters with the sites and contains three dimensions: responsiveness, compensation, and contact. The study modified the E-S-QUAL scale into six dimensions namely (efficiency, availability, fulfillment, privacy, responsiveness and contact). These are hypothesized to significantly influence customers’ satisfaction and loyalty intentions as shown in the following hypotheses diagrammatized in Figure 1. H1: E-S-QUAL dimensions do not significantly influence undergraduate students’ satisfaction with the banks’ internet banking services. H2: E-S-QUAL dimensions do not significantly influence undergraduate students’ loyalty intentions to the banks’ internet banking services. H3: There is no significant relationship between customer satisfaction and loyalty intentions. Efficiency: This is the ease and speed of accessing and using the internet banking sites. Fulfillment: This is the extent to which the internet banking sites’ promises about service delivery are fulfilled. Availability: This describes the correct technical functioning of the internet banking sites. This dimension is a measure showing that the banks’ website is highly functional and available for customers’ use any day, anytime. Privacy: This is the degree to which the internet banking sites are safe and protect customer information. Responsiveness: This is the effective handling of problems through the internet banking sites. Contact: This is defined as the availability of assistance through telephone or online representatives of banks. Many studies have been extensively conducted to determine the influence of electronic service quality on customer satisfaction and loyalty intentions in continents such as Asia, Middle East, Europe and Africa. In Asia, Lii  conducted a study among 213 e-banking customers in Indonesia on the e-service quality dimensions determining the loyalty of the internet banking customers. The results of the study revealed that loyalty of e-banking customers is directly affected by satisfaction and trust in an online bank and both satisfaction and trust are determined by the customers’ perception of website quality, corporate image, and social presence, with the dimension of website quality exhibiting the strongest impact. The study concluded that customer satisfaction exhibits a great critical effect in mediating the relationship between trust and loyalty. Khan and Mahapatra  evaluated the quality of internet banking services from customers’ perspective. This was done using a total of 1143 bank customers from the selected banks in India. The study employed seven internet service quality dimensions which include Reliability, Accessibility, Privacy/Security, Efficiency, Responsiveness, Fulfilment and User-friendliness. Findings revealed that customers are highly satisfied with the quality of service based on the five dimensions of - Reliability, Accessibility, Privacy/Security, Responsiveness and fulfillment, but they were least satisfied with the User-friendliness and Efficiency. Yee and Faziharudean  carried out a study on factors affecting customer loyalty in the use of internet banking in Malaysia using a total of 350 customers. The results of the study revealed that trust, habit and reputation have a significant influence on loyalty with reputation being the strongest. Service quality and perceived value were found to have no influence on customer loyalty. Further findings showed that service quality was an important factor in influencing the adoption of the technology, but did not have a significant influence on retention of customers. Chu, Lee and Chao  examined the relationship between service quality, customer relationship, and customer trust and customer loyalty in an e-banking context among 442 respondents in 26 Taiwanese banks. Findings showed that service quality had a positive and strong impact on customer loyalty along with customer satisfaction and trust. In the Middle East, Sohail and Shaikh  carried out an empirical study on the service quality of internet banking services with the aim to improve the level of customer satisfaction among a total of 939 respondents in Saudi Arabia. The study identified four dimensions which influence users’ evaluation of service quality of the internet banking services and they were labeled as Efficiency, Security, Fulfillment and Responsiveness. The result showed that all the four dimensions of internet banking service quality have a great influence on customers’ perception of internet banking services and increasing their overall level of customer satisfaction. Alsamdyai, et al. investigated factors affecting consumer satisfaction with internet banking services among 441 customers of commercial banks in Amman, Jordan. The study presented five dimensions namely e-banking service quality, personal factors, perceived usefulness, customer satisfaction, and continuity to deal with e-banking services. All dimensions/factors included in the study had impact on customer satisfaction and loyal intentions. Moreover, the results of the study indicated that there is a significant relationship between all dimensions or factors. Zavareh, et al. examined the effect of electronic service quality (E-S-Qual) on customer satisfaction among 392 internet banking users from four main public banks in Iran. The study used E-S-Qual dimensions of Efficiency, Reliability, Fulfillment, Security/Trust, Website aesthetics, Responsiveness and Ease of use. Only the three dimensions - Security/Trust, Website aesthetics, and Ease of use had significant positive effect on customers’ satisfaction with internet banking services in Iran. In Europe, Floh and Treiblmaier  conducted a study among 2000 customers of a pure dotcom bank in Austria. The study conceptualized loyalty in terms of attitudinal and behavioural dimensions consisting of recommendation and repeat purchase behaviour. The study found out that website quality indirectly influences e-loyalty through the mediating effects of service quality, overall satisfaction and trust. The authors also proposed that these relationships are moderated by gender, age, involvement, variety seeking behaviour and technophobia. The result findings indicate that loyalty of e-banking customers is directly affected by satisfaction and trust in an online bank, also loyalty of customers is influenced by the web site quality and service quality of the bank. In Africa, studies have been carried out in both South Africa and Nigeria. In South Africa, Dhurup, et al. provided insights on a framework for understanding customer perceptions of the quality of technology-based or internet banking service and established the relationship of the service quality dimensions with customer satisfaction and loyalty among 200 Internet banking customers in Southern Gauteng. The internet service quality dimensions employed in the study were Assurance, Responsiveness, and Ease of use, Accessibility, Fulfillment, Speed/Accuracy, and Contact. The result provided sufficient evidence to prove that the seven dimensions of internet service quality have a positive influence on customer satisfaction and loyalty. In Nigeria, Akinyele and Olorunleke  carried out an empirical study on technology and service quality in the Nigerian banking industry. The research study was carried out among 120 customers of Oceanic bank in Lagos metropolis. The service quality dimensions that were examined included - Security, Ease of use, Complaint satisfaction, Convenience, Efficiency, and Accuracy. The result revealed that the most important dimension was Security followed by Convenience. Olalekan  conducted a similar, however, examining gender differences among internet banking customers which included 750 males and 750 females in Nigeria. The results of the study indicate that male customers patronize internet banking because of its familiarity, comfort, cost effectiveness, independence, high level of involvement, easy to use feature, friendliness, and wide variety of internet banking services while the female customers particularly patronize internet banking because of its accuracy and speed. The study adopted the survey research design. According to Babbie, Halley and Zaino , survey design is the best method used to seek the opinions of individuals on a particular problem or existing challenges in a large population. The University of Ibadan was purposively selected for the study. University of Ibadan, Nigeria is located in Ibadan, Oyo State which occupies the South-Western geo-political region in Nigeria. The university was chosen because it is one of the foremost and prestigious universities established in the country. The university has thirteen (13) faculties with a total population of twelve thousand, eight hundred and ninety four (12, 894) undergraduate students as at 2017. The population of the undergraduate students in this study was obtained from the Planning/MIS unit of the university (Academic Planning Unit, University of Ibadan). The target population for this study is the undergraduate students of the University of Ibadan who use the internet banking services of banks in Nigeria. The population size was however indeterminate. Hence, accidental and snowball sampling techniques were used in getting the respondents for the study. In using accidental sampling, the study included as respondents any students within reach who affirmed to using internet banking. For the snowball sampling technique, each student introduced the researcher to another student using internet banking. Section A (Demographic data) - This is the first part of the questionnaire which gathered information pertaining to the demographic characteristics of the respondents. Data collected included: age, gender, level of study, faculty, and department of study. Section B (Use of Internet banking website) - This section collected information about the name of bank the student is using to perform his or her internet banking services, the years of experience in using internet banking and the purpose of using internet banking services. Section C (E-service quality dimensions) - This section which was adapted from the E-S-QUAL scale developed by Parasuraman, et al. , measured the dimensions of Efficiency, Availability, Fulfillment, Privacy, Responsiveness and Contact. This section assessed the performance of the internet banking platforms based on these dimensions. Section D (Customer satisfaction and Loyalty intentions) - This section measured the Overall Satisfaction of students with the internet banking platforms and their Loyalty intentions. The reliability of the items in the dimensions was determined using the Cronbach’s alpha coefficient analysis and the result presented in Table 1. Table 1: Cronbach alpha correlation. Since the Cronbach alpha values were above 0.7 , it shows that the data was sufficiently reliable to be used for data analysis, hence the items were retained. Copies of the questionnaire were personally administered to the respondents by the researchers. Students were approached in their faculties and halls of residence. A total of 178 copies were administered and 167 returned translating to 93.8per cent return rate. Thus, data analysis was based on the 167 responses. Collected data were input into the Statistical Package for Social Sciences (SPSS) software for statistical analysis. Frequency and percentage distributions were used for descriptive statistics while, ordinal regression, multiple regression and Spearman rank correlation analyses were performed to test the hypotheses. Regression analysis was used because it helps to estimate the influence or effect of a variable on another variable while Correlation analysis was used to analyze the relationship between the respondents’ overall satisfaction and loyalty intentions. The hypotheses were tested at 0.05per cent level of significance. As shown in Table 2, a large proportion of the respondents were males (60.5 per cent). Respondents between the ages of 20–24 years made up the highest (58.0 per cent) of the respondents, followed by those in the 15–19 years (19.2 per cent); only 4 per cent of the respondents were above 30 years of age. Table 2: Frequency table showing demographic distribution of the respondents. Also, the distribution of respondents by their level of study showed 14.4 per cent in 100 level, 27.5 per cent in 200 level, 23.3 per cent in each of 300 and 400 levels while 10.2 per cent were in 500 level and 1.2 per cent accounted for respondents found in 600 level. Most of the respondents were from faculties of Science (20.9 per cent), Agriculture (19.1 per cent), Social sciences (12.6 per cent) and Education (12.0 per cent). Table 3 presents the descriptive analysis of the internet banking websites of Nigerian banks used by the respondents. Table 3: Banks’ internet banking sites used by respondents. A high number of the respondents (31.1 per cent) were customers of Guaranty Trust Bank (GTB), followed by First Bank of Nigeria (FBN) (30.5 per cent), Access bank (9.0 per cent), United Bank for Africa (UBA) (8.4 per cent), and Diamond bank (7.8 per cent). The “Other banks” in the table above has a total percentage of respondents with 13.2 per cent, with Skye bank having the highest percentage of respondents (5.4 per cent) (Table 3). Table 4 presents the descriptive analysis of the respondents’ years of using internet banking platforms of the banks. Table 4: Years of experience in using internet banking. The result presented in Table 4 reveals that majority of the respondents (94.6 per cent) have used their banks’ internet banking services for only 5 years and below. Of the 94.6 per cent who have used internet banking services for only 5 years and below, 29.9 per cent were GTB customers and 28.7 per cent from FBN. Table 5 shows the different internet banking services as used by the respondents. Table 5: Internet banking services used. A large percentage of the respondents use the internet banking platforms to buy airtime (91.0 per cent), check their bank account balances (91.0 per cent) and transfer funds (90.4 per cent). A total of 71.3 per cent of respondents use their internet banking platforms to pay for goods online, while only 55.1per cent of respondents use the internet banking service for payment of bills (Table 5). Table 6 however shows a breakdown of the frequency of use of these internet banking services in the different banks. Table 6: Frequency of use of the different internet banking services. Table 6 shows that majority of the respondents (69.4 per cent) use the internet banking services to purchase airtime for their use, with GTB having the highest percentage of respondents (24.0 per cent) which is closely followed by FBN (21.6 per cent). This trend was however not observed in the use of the internet banking platforms for transfer of funds and account balance enquiry as a higher percentage of respondents who use these services frequently were FBN customers. Table 6 also shows that most of the respondents either occasionally or never used the sites for bills payment and online payment for goods. This is a measure of the overall satisfaction of respondents in using a bank’s internet banking platform. Figure 2 presents the result of the assessment of respondents on their overall level of satisfaction. 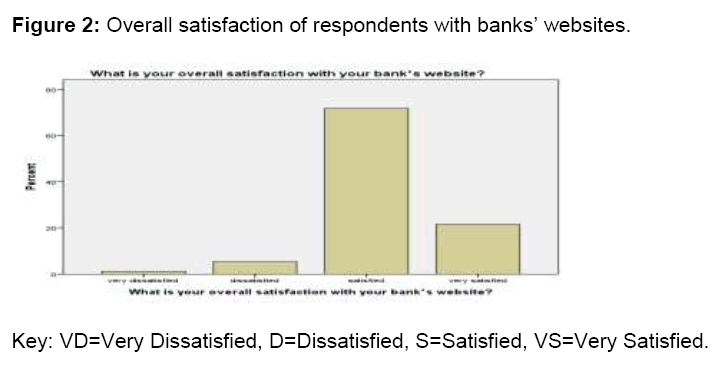 Figure 2: Overall satisfaction of respondents with banks’ websites. Figure 2 above shows that over 70 per cent of the respondents were satisfied with their banks’ internet banking services while over 20 per cent of the respondents were very satisfied. Also, 6.6 per cent of the respondents were dissatisfied with their banks’ internet banking platforms. This is a measure of the customers’ intentions to continue using their banks’ internet banking platforms. Table 7 presents the descriptive analysis of loyalty intentions. Table 7: Assessment of customers’ loyalty intentions. The result as observed in Table 7 shows that a high percentage of respondents (91.6 per cent) are likely to recommend their bank’s website to someone who seeks their opinion. Generally, respondents are loyal to their banks and intend to continue using their banks’ internet banking platforms; however 13.8 per cent of the respondents reported that they are unlikely to consider their banks’ websites for future transactions. This section presents the results of the regression analysis performed in testing the hypotheses. The hypotheses were tested at 0.05 level of significance. Hypothesis 1: E-S-QUAL dimensions do not significantly influence undergraduate students’ satisfaction with the banks’ internet banking services. Tables 8a and 8b presents the results of the ordinal regression analysis, where the dependent variable is customer satisfaction, and the independent variables are the six E-S-QUAL dimensions. Table 8a: Result showing the model fitting information. Table 8b: Ordinal regression - E-S-Qual dimensions influencing customer satisfaction. As shown in Table 8a, a test of the full model was statistically significant (Chi square=70.195, p=0.000 with df=6), showing that the ordinal regression model has overall goodness-of-fit. This shows that the independent variables as a set reliably influenced customer satisfaction. From Table 8b, only the two dimensions of Efficiency and Responsiveness (p<0.05) significantly influenced customer satisfaction. Hence, the null hypothesis is therefore rejected. This indicates that for every increase in the efficiency of the banks’ internet banking sites, the odd of customers being satisfied increases by 1.478, while other variables are held constant. Also, for every increase in the responsiveness of the banks’ websites, the odd of customers being satisfied increases by 1.269, while other variables are held constant. Hypothesis 2: E-S-QUAL dimensions do not significantly influence undergraduate students’ loyalty intentions to the banks’ internet banking services. Tables 9a-c show the result of the multiple regression analysis showing the influence of the six E-S-QUAL dimensions on loyalty intentions. The dependent variable is loyalty intentions, and the independent variables are the six E-S-QUAL dimensions. Table 9a: Result showing model summary of regression analysis. Table 9b: Result of ANOVAa. Table 9c: Multiple regression - E-S-Qual dimensions influencing customer satisfaction. As shown in Table 9a, the multiple correlation coefficient R value of 0.551 indicates a good level of prediction by the E-S-QUAL dimensions. However, the R Square value of 0.303 shows that the six E-S-QUAL dimensions explained only 30.3per cent of the variability of the dependent variable, loyalty intentions. The F-ratio in the Anova table tested whether the overall regression model was a good fit for the data (Table 9b). At F(6,160)=11.619, p<0.005, the regression model is considered a good fit for the data. This means that the independent variables statistically significantly predicted the dependent variable. Table 9c shows that fulfillment is the only dimension that is statistically significant in influencing customers’ loyalty intentions. Hence the null hypothesis is rejected. This means that for every unit increase in the fulfillment dimension, customer loyalty intentions increases by 0.527. Hypothesis 3: There is no significant relationship between customer satisfaction and loyalty intentions. Table 10 presents the result of the Spearman correlation analysis testing the relationship between customer satisfaction and loyalty intentions. Table 10: Relationship between customer satisfaction and loyalty intentions. The Spearman rho (rho=0.451) shows that there is a positive moderately strong relationship between customer satisfaction and loyalty intentions. At p<0.05, the relationship is statistically significant. This implies that for every increase in customer satisfaction, loyalty intentions also increase (Table 10). With respect to the different banking websites of GTB, FBN, UBA, Access, Diamond and other banks used in the study, findings from this study showed that a high number of customers frequently use internet banking services for purchasing airtime/recharge phone, transferring funds, making account balance enquiries. Some of the undergraduates also use these platforms to pay for goods, while a high number of them rarely use or have never used their banks’ internet banking platforms to pay bills. One reason can be deduced for the low proportion of undergraduates who use their banks’ internet banking platforms to pay bills. Majority of students do not belong in the class of income earners as they are mostly unemployed, and their means of upkeep is largely dependent on parental support therefore it is not a surprise that these students rarely pay bills through internet banking. Hence, using Internet banking services for paying bills such as DSTV and other utility bills might not be a common option among the undergraduate customers. Only the dimensions of Efficiency and Responsiveness had positive influence on the overall customer satisfaction with the internet banking platforms. Studies have reported diverse findings on the influence of these two dimensions. Khan and Mahapatra  reported that internet banking customers in India showed high satisfaction with the quality of service on four dimensions such as reliability, accessibility, privacy/security, responsiveness and fulfillment, but least satisfied with the 'user-friendliness' dimension. Kaur and Kaur  similarly reported that among Indian bank customers, Responsiveness, Security/Privacy and Site-Aesthetic are influential factors, whereas, Reliability and Efficiency have insignificant impact on satisfaction of the online customers. In a study among Internet banking customers of private sector, public sector and foreign banks in Delhi, Gupta and Bansal  reported that among the 5 dimensions of Security/Privacy, Reliability, Efficiency, Responsiveness, and Site Aesthetics, Efficiency dimension has the most significant influence in determining the level of customer satisfaction with internet banking websites. Findings from the current study revealed that among the undergraduate students, a well-organized internet banking site that is simple to use and facilitates easy transactions would influence customer satisfaction. Similarly, in respect to the dimension of Responsiveness, the students in this study would be more satisfied with their banks’ internet banking platforms when problems related to their internet banking transactions are promptly handled by their respective banks. Findings in this study revealed that only the dimension of fulfillment had a significant influence on customer loyalty intentions. The implication of this is that irrespective of other service quality dimensions, undergraduate students would continue to patronize their banks’ internet banking platforms as long as these banks continue to deliver on their promises truthfully. A contrary finding was however reported by Dhurup, et al. where the dimension of fulfillment had no significant predictive influence on customer loyalty among internet banking customers in South Africa. In a similar study Ariff, et al. reported that among internet banking customers of a commercial bank in Malaysia, beside the technical and functionality aspects of service quality such as efficiency, fulfillment and system availability, the aesthetic value and proper guidance of the websites are also crucial to customer loyalty to the internet banking sites. This study also showed that a significant relationship exists between customer satisfaction and loyalty intentions among the internet banking customers. Hence, undergraduate students who are satisfied with their banks’ internet banking platforms would most likely continue to patronize their banks for these services. A strong positive relationship between customer satisfaction and loyalty has been variously reported in the literature. Ariff, et al. reported a strong positive and significant relationship (B=0.786, p<0.05) between customer satisfaction and loyalty among internet banking customers in Malaysia. Similar findings (r=0.629, p<0.05) were reported by Dhurup, et al. among internet banking customers in South Africa. Most likely, undergraduate students in the current study area will not only repatronize their banks’ internet banking services in the future but will also be willing to recommend their banks’ websites to their circle of friends and family. The study has shown that undergraduate students of the University of Ibadan who are internet banking customers of Nigerian banks are generally satisfied with the banks’ internet banking services. A well-organized internet banking site, easy and simple to use and which at the same time promptly handles internet banking issues was identified to positively influence customer satisfaction. Moreover, the undergraduate students would continue to patronize their banks’ internet banking services and recommend same to others as long as these banks continue to accurately deliver on their promises through this platform. However, although only three of the E-S-Qual dimensions significantly influenced customer satisfaction and loyalty, this does not make the other dimensions less relevant as customers’ assessment of service quality might be a much more complex phenomenon that can be understood using the E-S-Qual scale. Hence, Nigerian banks must continuously work on their banking websites by focusing on these three dimensions as well as all the other dimensions in the E-S-Qual scale to ensure meeting and exceeding their customers’ expectations. Overall, this study has shown factors that are most important to the youths as far as internet banking services are concerned and findings from this study would assist banks in designing internet banking sites that would be satisfactory to this population of users, especially considering the obvious fact that youths constitute the highest proportion of internet users. One limitation identified in this study is that undergraduate students of only one university were respondents. Hence, further studies could be expanded to include as many universities as possible in Nigeria in order to provide a more generalizable result. Secondly, the study was carried out amongst the undergraduate students as internet banking customers; further studies can include the postgraduate students in order to facilitate a comparison of the two different groups. These two suggestions would serve to provide a more holistic view of the factors influencing satisfaction and loyalty to banks’ internet banking services among university students. Couto JP, Tiago T, Tiago F (2013) An analysis of internet banking in Portugal: The antecedents of mobile banking adoption. International Journal of Advanced Computer Science and Applications 4: 117-123. Lee MC (2009) Factors influencing the adoption of internet banking: An integration of TAM and TPB with perceived risk and perceived benefit. Electronic Commerce Research and Applications 8: 130-141. Akinci S, Aksoy S, Atilgan E (2004) Adoption of internet banking among sophisticated consumer segments in an advanced developing country. The International Journal of Bank Marketing 22: 212-232. Al-Hajri S (2008) The adoption of e-Banking: The case of Omani banks. International Review of Business Research Papers 4: 120-128. Oliver RL (1997) Satisfaction: A behavioral perspective on the consumer. Irwin/McGraw-Hill, New York. Oliver RL (1999) Whence customer loyalty? Journal of Marketing 63: 33-44. Parasuraman A, Zeithaml VA, Malhotra A (2005) E-S-QUAL: A multiple-item scale for assessing internet service quality. Journal of Service Research 7: 213-234. Omotayo FO, Adebayo AK (2015) Factors influencing intention to adopt internet banking by postgraduate students of the University of Ibadan, Nigeria. Journal of Internet Banking and Commerce. Sum Chau V, Ngai LW (2010) The youth market for internet banking services: perceptions, attitude and behaviour. Journal of Services Marketing 24: 42-60. Jing G, Yoo IS (2013) An empirical study on the effect of e-service quality to satisfaction. International Journal of Management Sciences and Business Research 2: 25-31. Onaolapo AR, Anene EC (2016) Bank service quality, mobile connectivity and adoption of internet banking among selected university students in Oyo State Nigeria. International Journal of Managerial Studies and Research 4: 38-48. Lii YS (2009) A model of customer e-loyalty in the online banking. Economics Bulletin 29: 891-902. Khan MS, Mahapatra SS (2008) Service quality evaluation in internet banking: An empirical study in India. International Journal on Indian Culture and Business Management 2: 30-46. Yee BY, Faziharudean TM (2010) Factors affecting customer loyalty of using internet banking in Malaysia. Journal of Electronic Banking Systems. Chu PY, Lee GY, Chao Y (2012) Service quality, customer satisfaction, customer trust, and loyalty in an e-banking context. Social Behavior and Personality: An International Journal 40: 1271-1283. Sohail SM, Shaikh NM (2008) Internet banking and quality of service: Perspectives from a developing nation in the Middle East. Online Information Review 32: 58-72. Alsamdyai MJ, Yousif RO, Al-khasawneh MH (2012) The factors influencing consumer satisfaction and continuity to deal with e-banking services in Jordan. Global Journal of Management and Business Research 12: 129-142. Sanayei A, Jokar A (2013) Determining the effect of electronic services quality on electronic satisfaction and positive word of mouth (case study): Different branches of shiraz mellat bank customers. International Journal of Academic Research in Accounting, Finance and Management Sciences 3: 103-111. Shirzad E, Beikzad J (2014) E-banking service quality and its relationship with customer satisfaction at Mehr-Eqtesad Bank in Khuzestan. Kuwait Chapter of the Arabian Journal of Business and Management Review 3: 55-61. Floh A, Treiblmaier H (2006) What keeps the banking customers loyal? A multigroup analysis of the moderating role of consumer characteristics on e-loyalty in the financial service industry. Dhurup M, Surujlal J, Redda E (2014) Customer perceptions of online banking service quality and its relationship with customer satisfaction and loyalty. Mediterranean Journal of Social Sciences 5: 72-80. Akinyele ST, Olorunleke K (2010) Technology and service quality in the banking industry: An empirical study of various factors in internet banking services. International Business Management 4: 209-221. Olalekan AE (2011) E-banking patronage in Nigeria: An exploratory study of gender difference. Business Intelligence Journal 4: 243-252. Babbie ER, Halley F, Zaino J (2007) Adventures in social research: data analysis using SPSS 14.0 and 15.0 for Windows. Pine Forge Press. Nunnally JC (1978) Psychometric theory (2nd edition). McGraw-Hill, New York. Kaur J, Kaur B (2013) Determining internet banking service quality and customer satisfaction in India. Tenth AIMS International Conference on Management, pp: 2670-2679. Gupta KK, Bansal DI (2012) Development of an instrument to measure internet banking service quality in India. Journal of Arts, Science and Commerce 3: 11-25. Ariff MSM, Yun LO, Zakuan N, Ismail K (2013) The impacts of service quality and customer satisfaction on customer loyalty in internet banking. Procedia: Social and Behavioural Sciences 81: 469-473.